And so after three years of work in my spare time, it has come to pass that the Field Guide to the Butterflies of Singapore is finally completed and launched. 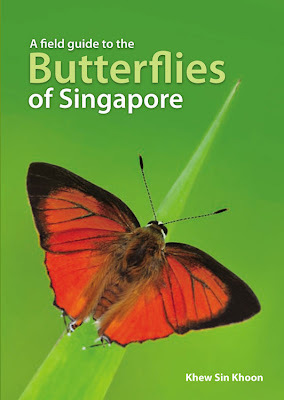 Its maiden flight took place on 10 Oct 2010 - an auspicious date indeed, giving the 'perfect' 10 backdrop for a comprehensive book on Singapore's butterflies that has been long-awaited. After a few initial disappointments and false starts, work on the book began in earnest some time in 2007 after I received a generous offer of a sponsorship for the book by Ms Ho Ching, Executive Director and CEO of Temasek Holdings. I was totally a newbie at authoring a book, and had little idea of the effort and time it would take to embark on such an undertaking. I had estimated about a year's worth of work. How wrong I was - it took me three! The research and writing didn't take very much time, although I later discovered, with the help of my several proof-readers that there were quite a lot of mistakes, both technical and grammatical. Even the issues of the usage of English and writing style were subjects for debate amongst a few of us. Then came the collection of photos from members of ButterflyCircle. 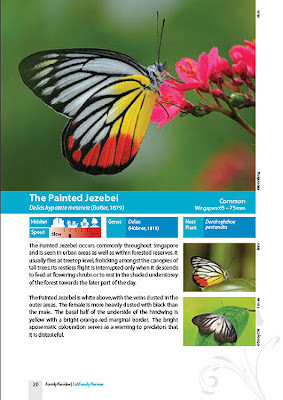 For this, I must thank the spontaneous and generous contributions of the veterans and newbies of ButterflyCircle alike, who did not hesitate to share their work with me. It certainly made the book more complete and far more comprehensive that I would have been able to make it by myself. The 370-page softcover book features a total of 291 of the current checklist of 295 species that we have recorded in Singapore. Of the remaining four, I only have voucher specimens and these are amongst the lookalike species for which I would not have been able to reliably identify from field shots. 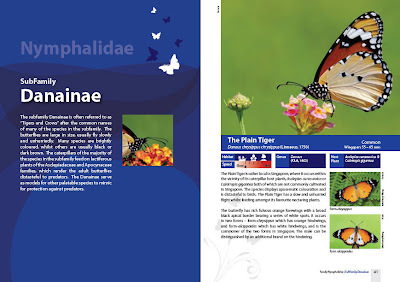 Of course, even as recently as just before the book went into print, ButterflyCircle members were already on the verge of validating a couple of new species, particularly from the Hesperiidae family. But that's another story for another future blog article. When I started on the layout of the book, I had wanted to put in as much information on the butterfly as possible, but without compromising the size of the photo of the butterfly. 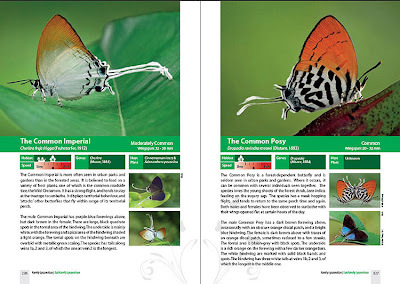 I have seen many well-written books, but with only rather small photos, and that would have been a pity and would not have done justice to the excellent butterfly photography that ButterflyCircle members had produced. Hence the layout of each page had one large primary photo and two smaller thumbnails that would depict either another angle or upperside/underside or male/female of the same species, where available. 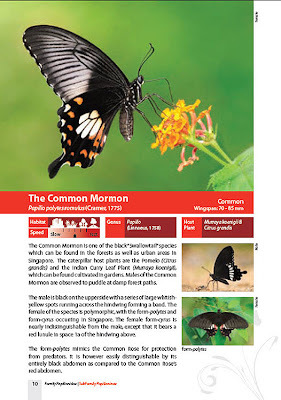 Scientific data like the author, year of description and so on were added, although the book features the English Common Name more prominently rather than the latin trinominal name. 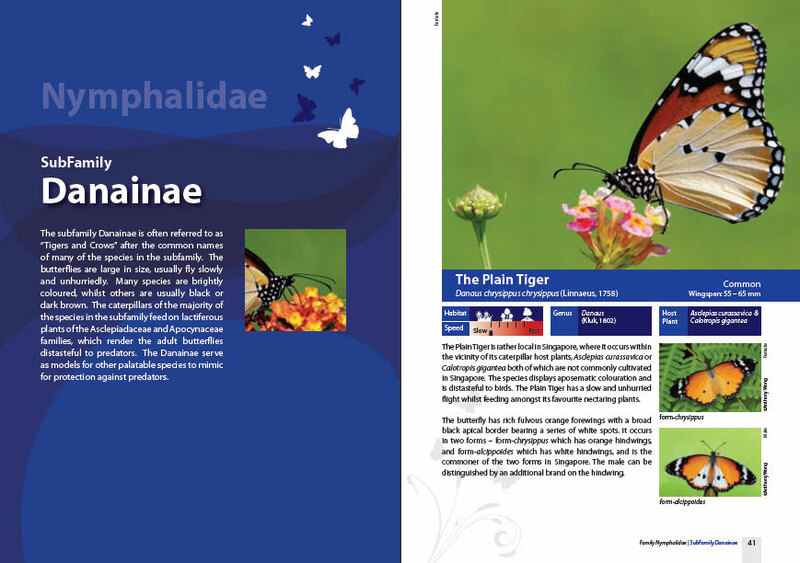 This is because the book is meant for the wider amateur enthusiast audience of all ages. 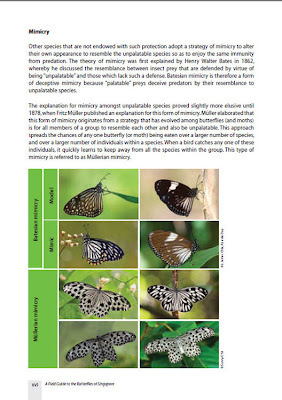 However, care was also taken to ensure biological and taxonomic accuracy as far as possible. The design, selection of colours, etc., were left in the capable hands of the talented designer from Ink On Paper Communications Pte Ltd, Ms Cressindie Santoso, who was well-advised by her experienced supervisors. Once the layout was settled and the colours for the various families confirmed, it was a matter of getting the best photos available and featuring each species as one would most likely encounter them in the field. 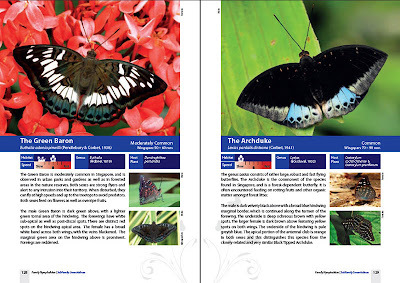 In order to avoid a 'regimented' layout, I selected photos where the butterflies would face different directions (left/right/up/down) when viewed in the book, particularly on adjacent and facing pages. The book launch was timed for 10am on 10 Oct 2010 at the Function Hall of the Botany Centre of the Singapore Botanic Gardens. 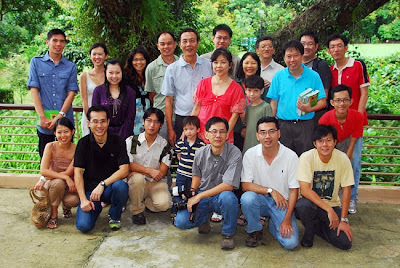 The garden setting, I thought, was befitting of a book on Singapore's biodiversity and also a casual environment that would set everyone at ease. 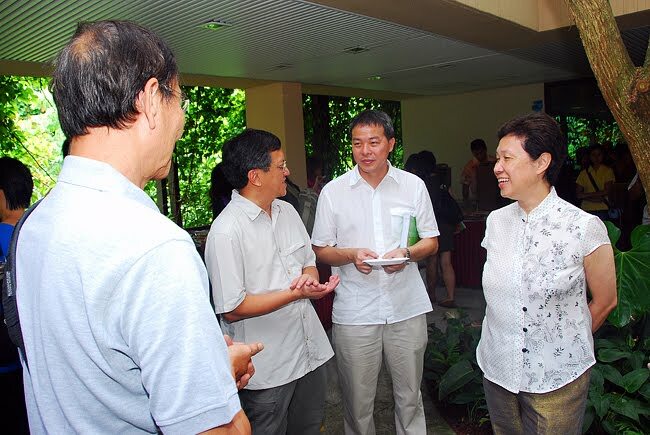 Special thanks to Dr Wong Wei Har, Director of the Singapore Botanic Gardens, for the arrangements that she helped to facilitate to get the premises for the launch. 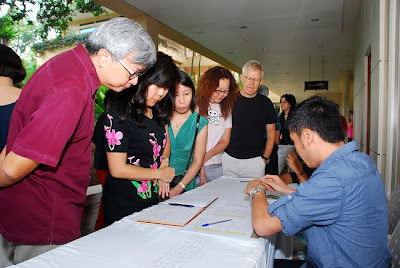 The invited guests started streaming in as early as 9:15am, and our hardworking volunteers from ButterflyCircle handled all the registration, issuing of book vouchers, ushering and so on very efficiently and without a hitch! Our official photographers were also out shooting candid shots of everyone! Thanks, Bobby, Loke, Sunny, Ellen and Ke-yang! Very soon it was time for the Guest of Honour to arrive, and our pretty MC, Kamesha, made the announcement for everyone to be seated in the hall to await the Guest of Honour. 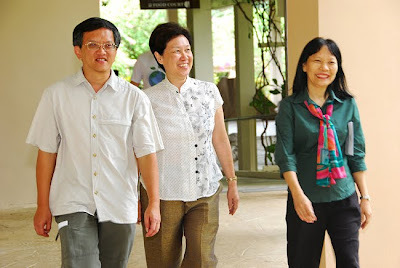 Ms Ho arrived on the dot, and the launch proceedings started. I met her at the drop-off point with my wife, and led her to the hall. 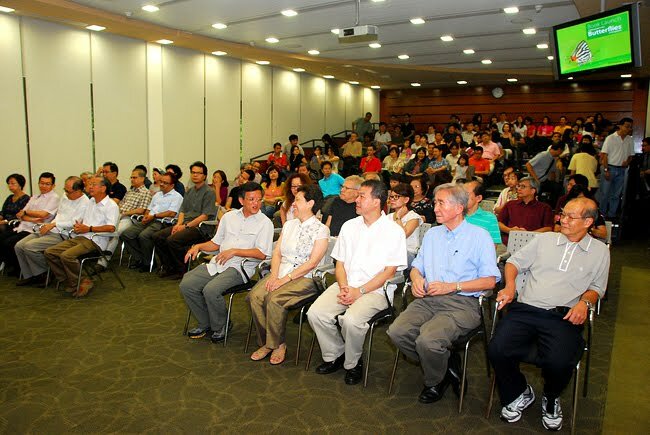 We observed a minute's silence as a mark of respect to the late Mrs Lee Kuan Yew, who had passed away just a week before. 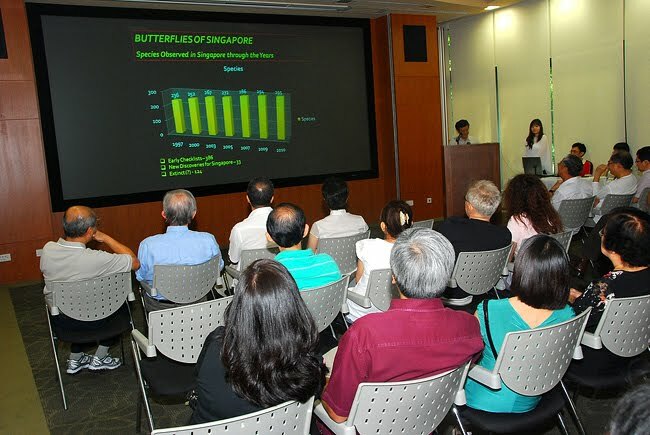 After a short welcome address and a slide show of some of my favourite shots from the book, the MC invited the Guest of Honour to launch the Field Guide to the Butterflies of Singapore via a short video clip. 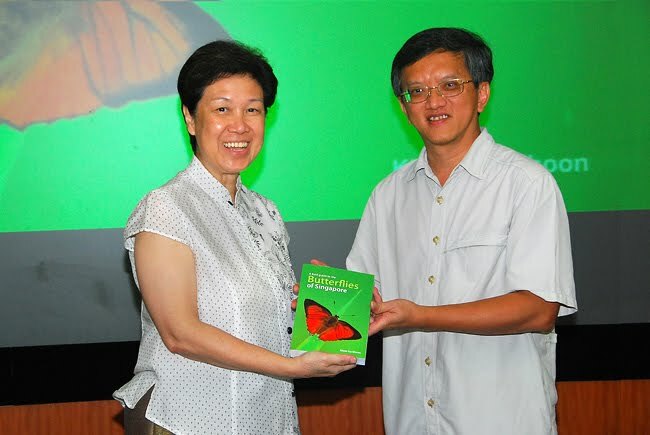 The launch ended when I presented the first copy of the book to Ms Ho Ching. 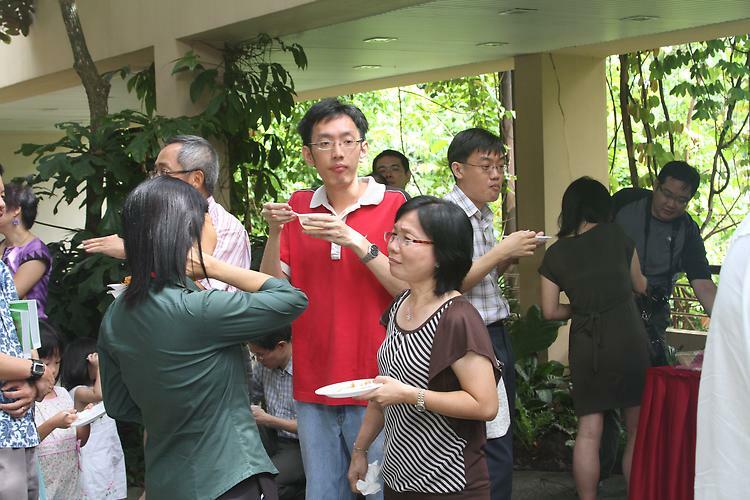 Everyone then proceeded to the Function Room and garden deck at Level 2 of the building for morning snacks. 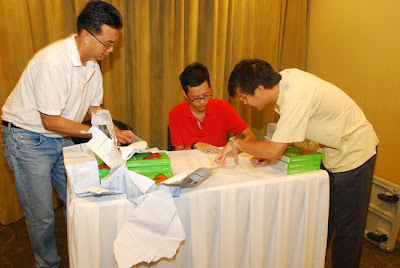 Book desks were also set up earlier to present complimentary copies of the book to guests. 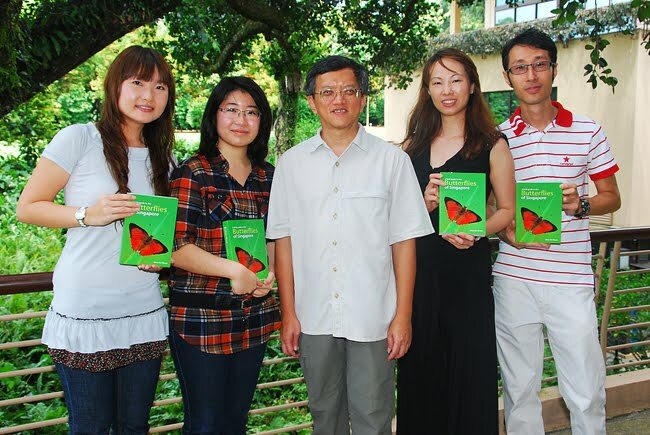 For those who wished to purchase extra copies of the book, limited copies were also made available. Everyone enjoyed the food, and mingled around, amongst old friends and making new ones. 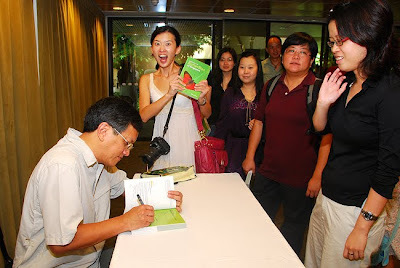 I obliged everyone who asked me to autograph their copy of the book. Ms Ho Ching also sportingly autographed the books of those who were lucky enough to approach her. Very soon, it was time for Ms Ho Ching to leave, and we escorted her to her car. 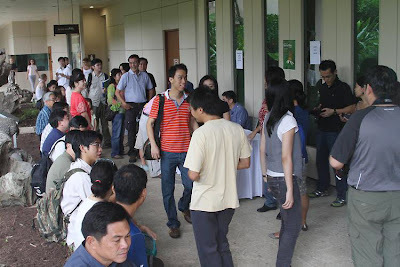 Many of the guests continued to enjoy the sunny morning, catching up with each other. 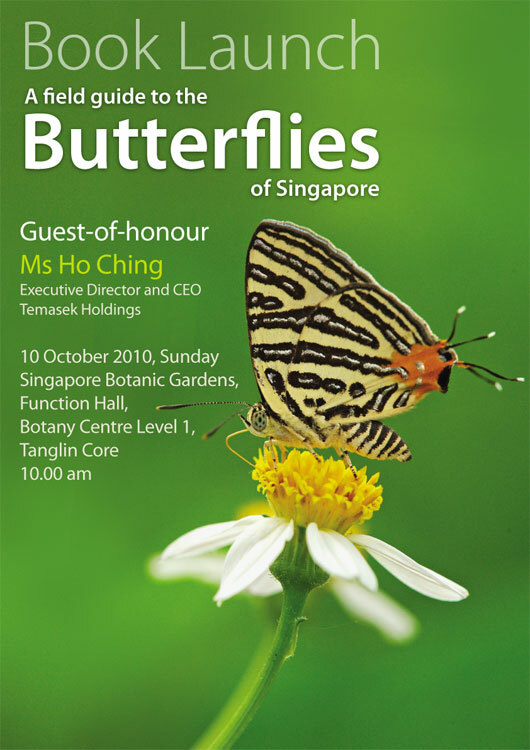 All in all, it was a successful launch, and the maiden flight of the Field Guide to the Butterflies of Singapore. 1,000 copies of the book will be donated to schools, libraries and other public institutions. (Thank you, Ms Ho Ching!) Some copies are expected to be kept as mementoes for special visitors and guests to Singapore. 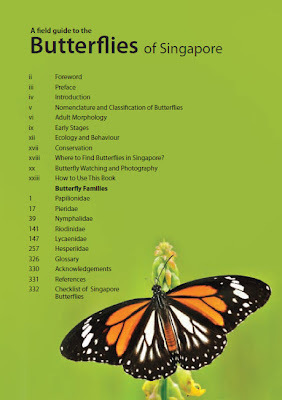 I also wish to thank everyone who has contributed and helped in the production of this book, without whose help, the Field Guide to the Butterflies of Singapore would not have become a reality.